These beautiful stud earrings for women showcase sparkly diamond-cut beads, for a chic and trendy look. These earrings are made of .925 sterling silver and are nickel free. These studs for women secure by post with friction-backs. These beautiful stud earrings for women showcase sparkly 10mm diamond-cut beads, for a chic and trendy look. 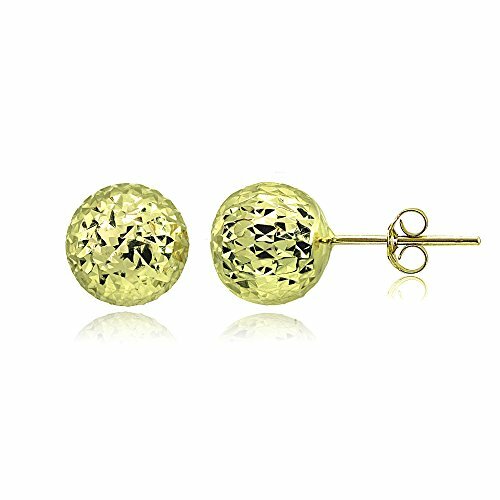 These earrings are made of yellow gold flashed.925 sterling silver and are nickel free. These studs for women secure by post with friction-backs. Wear this as wedding jewelry, holiday jewelry, Christmas jewelry and more special occasions. Give this as gifts to your woman, wife, girlfriend, mother or your teen girl for her birthday, graduation, anniversary, Christmas, Hanukkah, Mother's Day and Valentine's Day.